Detected in June, GW170608 has had a difficult time. It was challenging to analyse, and neglected in favour of its louder and shinier siblings. However, we can now introduce you to our smallest chirp-mass binary black hole system! The growing family of black holes. From Dawn Finney. Our family of binary black holes is now growing large. 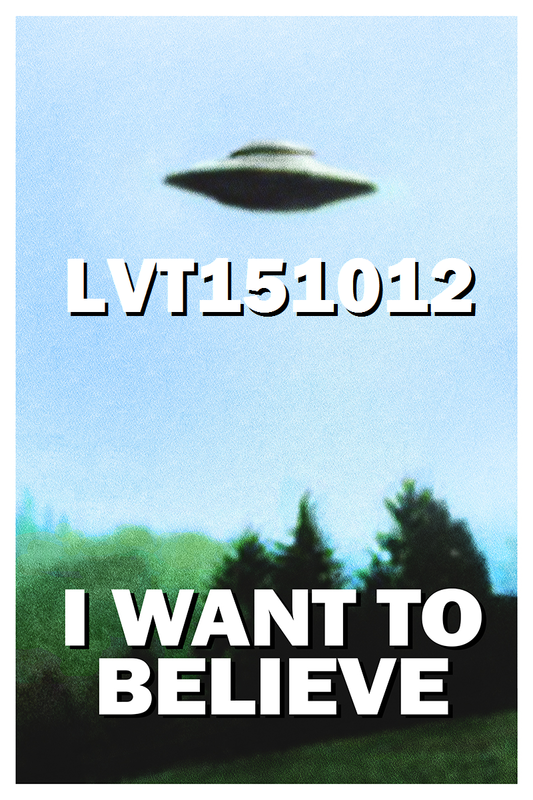 During our first observing run (O1) we found three: GW150914, LVT151012 and GW151226. The advanced detector observing run (O2) ran from 30 November 2016 to 25 August 2017 (with a couple of short breaks). 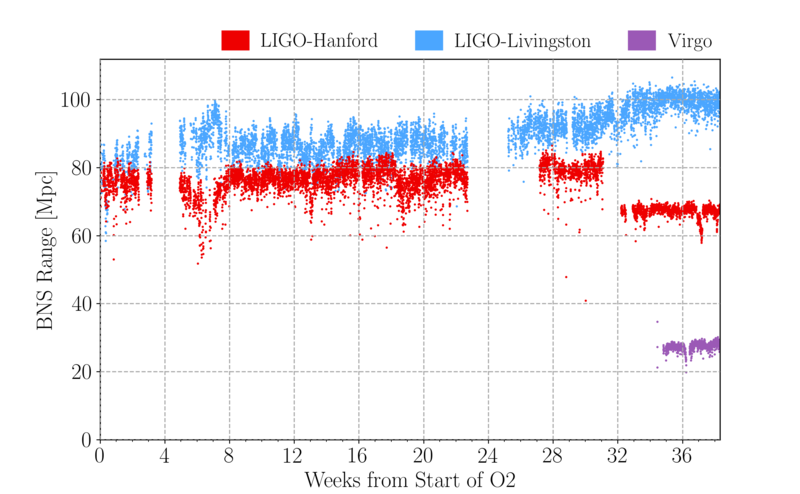 From our O1 detections, we were expecting roughly one binary black hole per month. 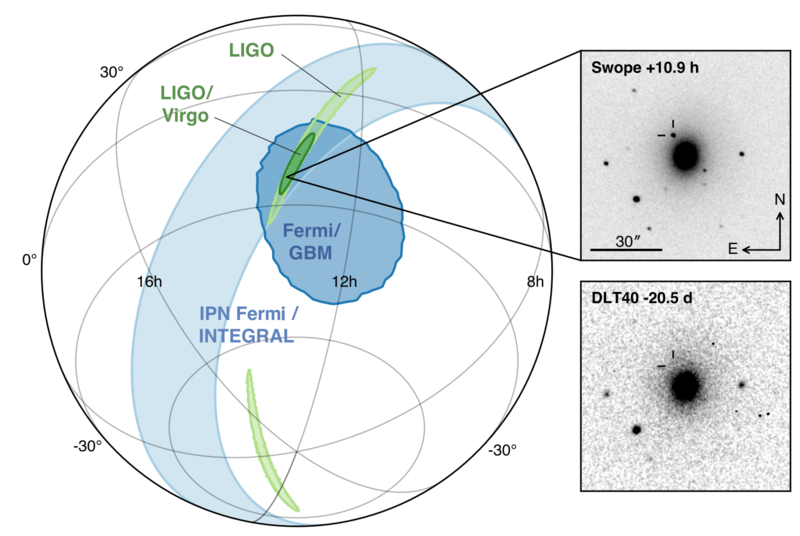 The first same in January, GW170104, and we have announced the first detection which involved Virgo from August, GW170814, so you might be wondering what happened in-between? 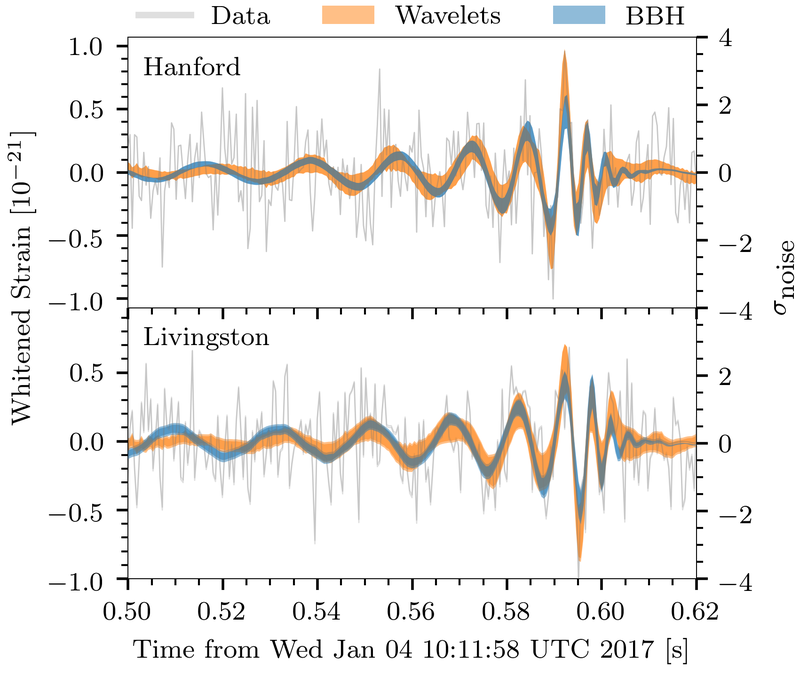 Pretty much everything was dropped following the detection of our first binary neutron star system, GW170817, as a sizeable fraction of the astronomical community managed to observe its electromagnetic counterparts. Now, we are starting to dig our way out of the O2 back-log. 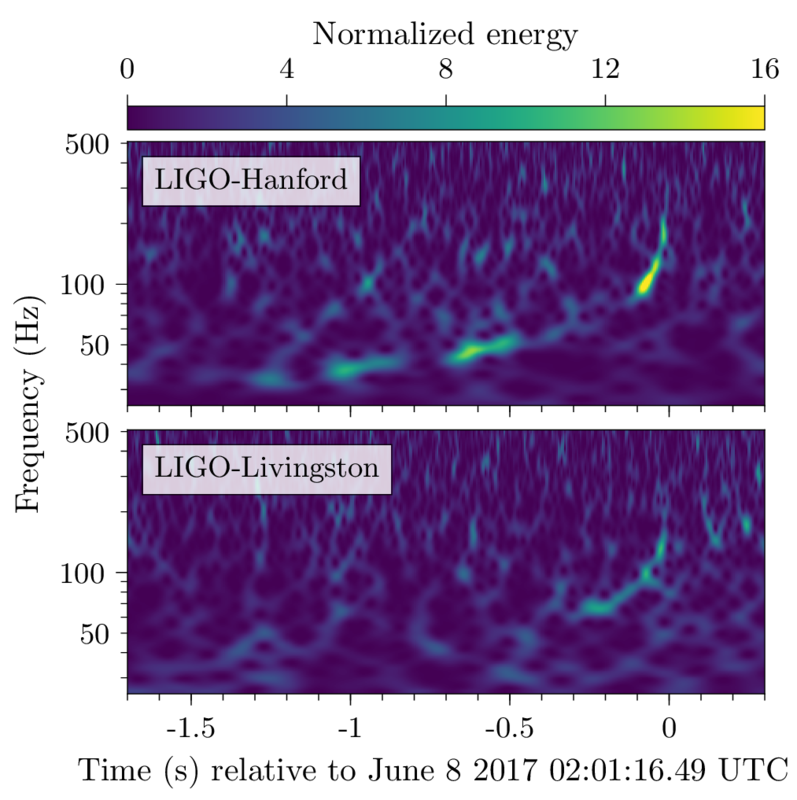 On 8 June 2017, a chirp was found in data from LIGO Livingston. At the time, LIGO Hanford was undergoing planned engineering work [bonus explanation]. We would not normally analyse this data, as the detector is disturbed; however, we had to follow up on the potential signal in Livingston. Only low frequency data in Hanford should have been affected, so we limited our analysis to above 30 Hz (this sounds easier than it is—I was glad I was not on rota to analyse this event [bonus note]). A coincident signal was found [bonus note]. Hello GW170608, the June event! 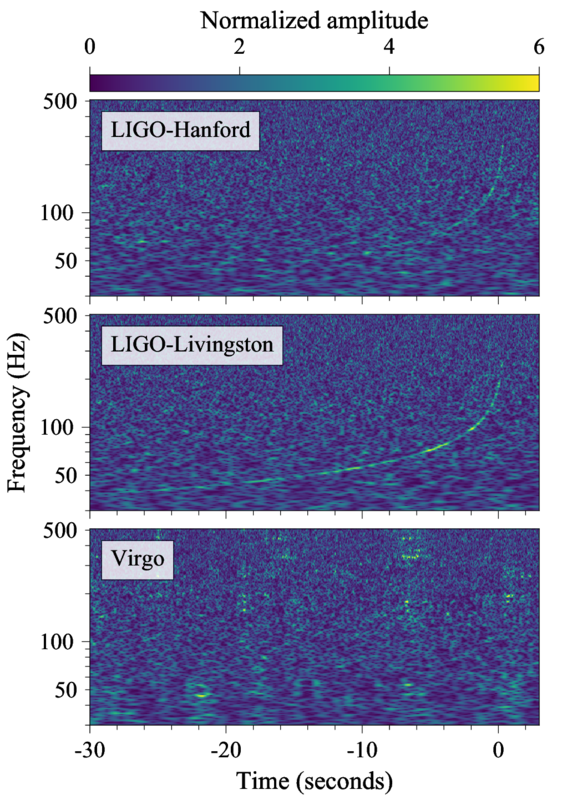 Time–frequency plots for GW170608 as measured by LIGO Hanford and Livingston. The chirp is clearer in Hanford, despite it being less sensitive, because of the sources position. 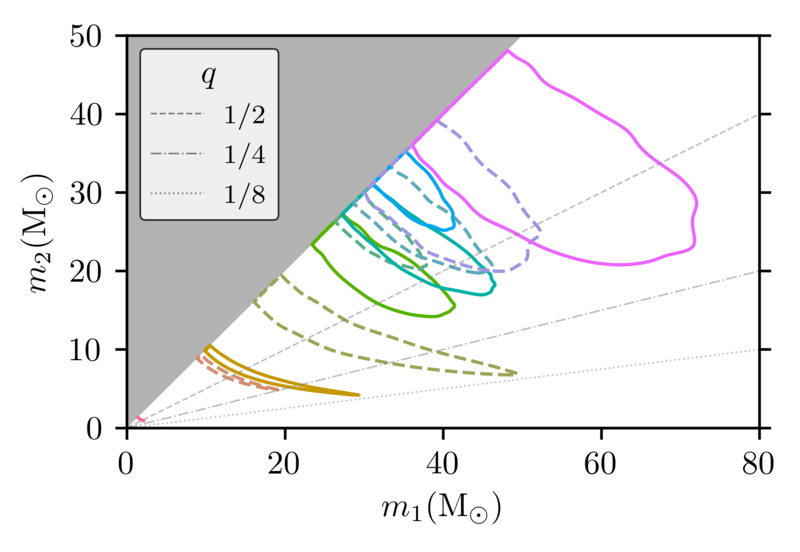 Figure 1 of the GW170608 Paper. Analysing data from both Hanford and Livingston (limiting Hanford to above 30 Hz) [bonus note], GW170608 was found by both of our offline searches for binary signals. PyCBC detected it with a false alarm rate of less than 1 in 3000 years, and GstLAL estimated a false alarm rate of 1 in 160000 years. 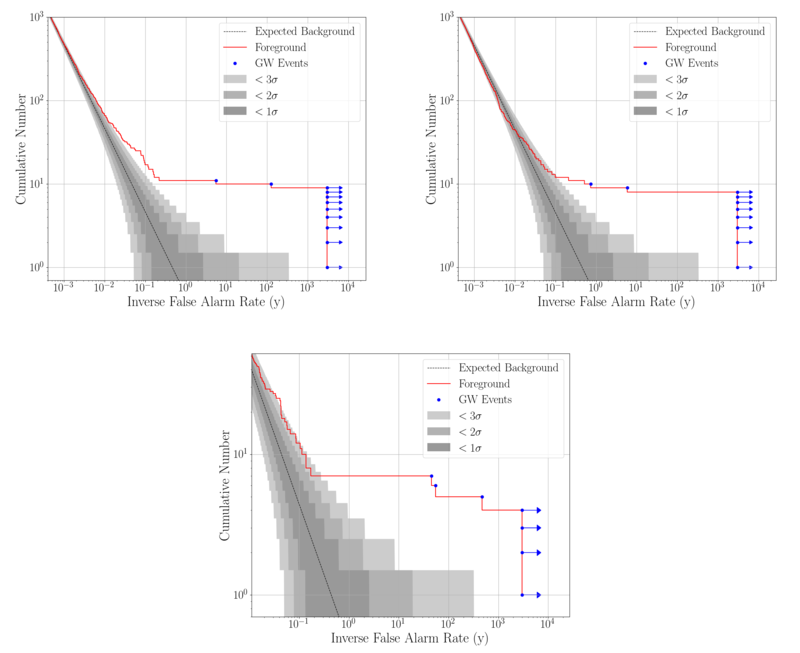 The signal was also picked up by coherent WaveBurst, which doesn’t use waveform templates, and so is more flexible in what it can detect at the cost off sensitivity: this analysis estimates a false alarm rate of about 1 in 30 years. GW170608 probably isn’t a bit of random noise. 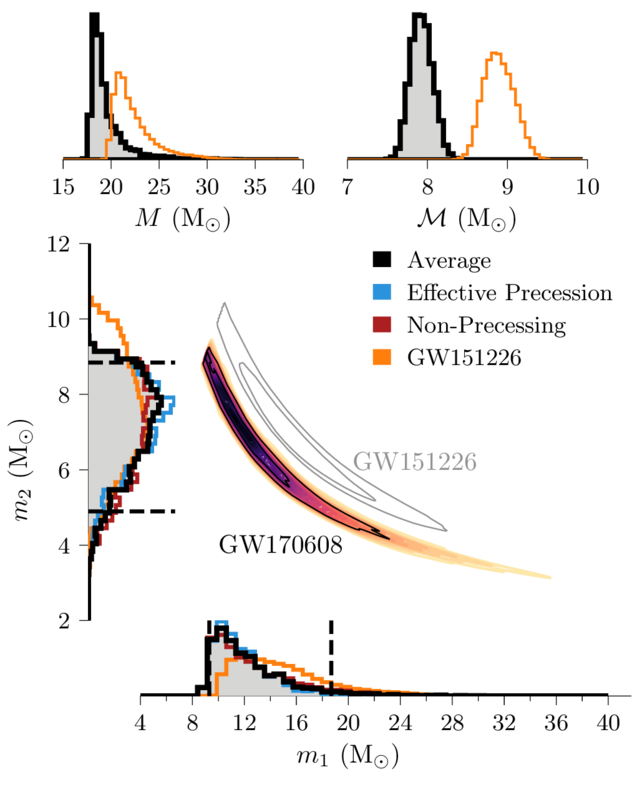 GW170608 comes from a low mass binary. 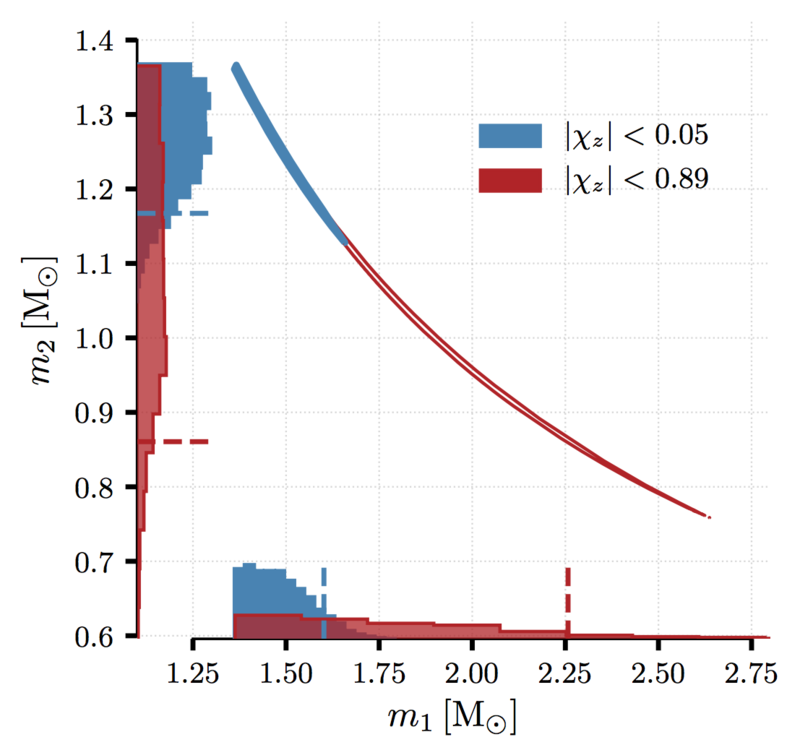 Well, relatively low mass for a binary black hole. For low mass systems, we can measure the chirp mass , the particular combination of the two black hole masses which governs the inspiral, well. For GW170608, the chirp mass is . This is the smallest chirp mass we’ve ever measured, the next smallest is GW151226 with . 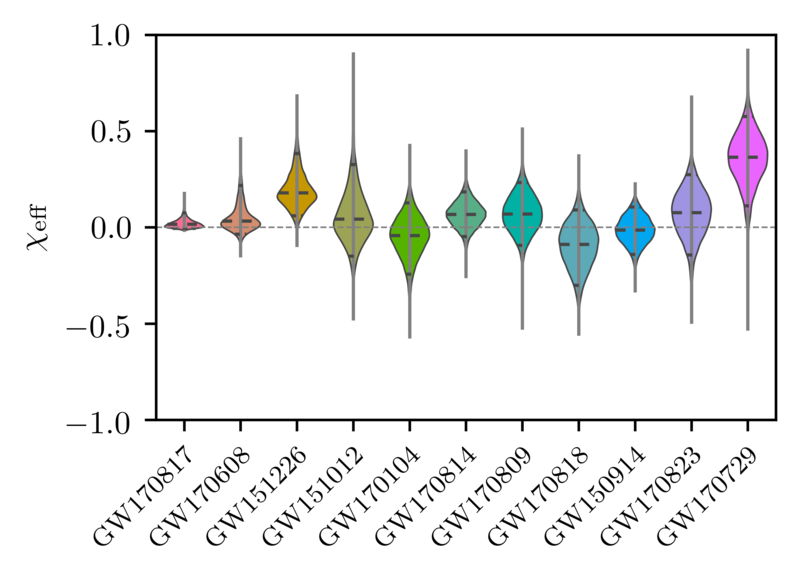 GW170608 is probably the lowest mass binary we’ve found—the total mass and individual component masses aren’t as well measured as the chirp mass, so there is small probability (~11%) that GW151226 is actually lower mass. The plot below compares the two. 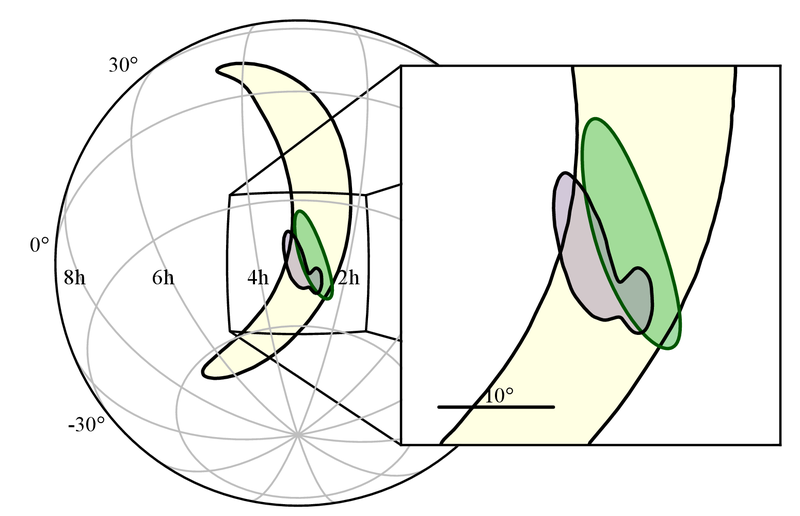 Estimated masses for the two black holes in the binary. 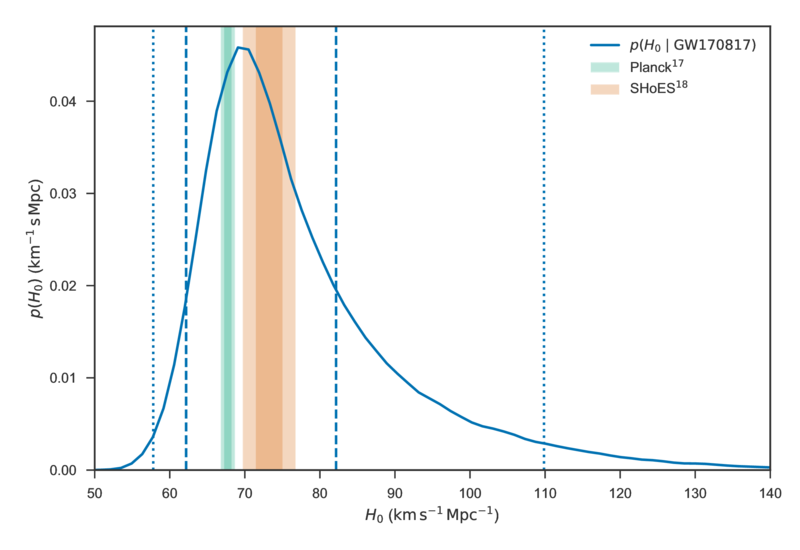 The two-dimensional shows the probability distribution for GW170608 as well as 50% and 90% contours for GW151226, the other contender for the lightest black hole binary. The one-dimensional plots on the sides show results using different waveform models. The dotted lines mark the edge of our 90% probability intervals. 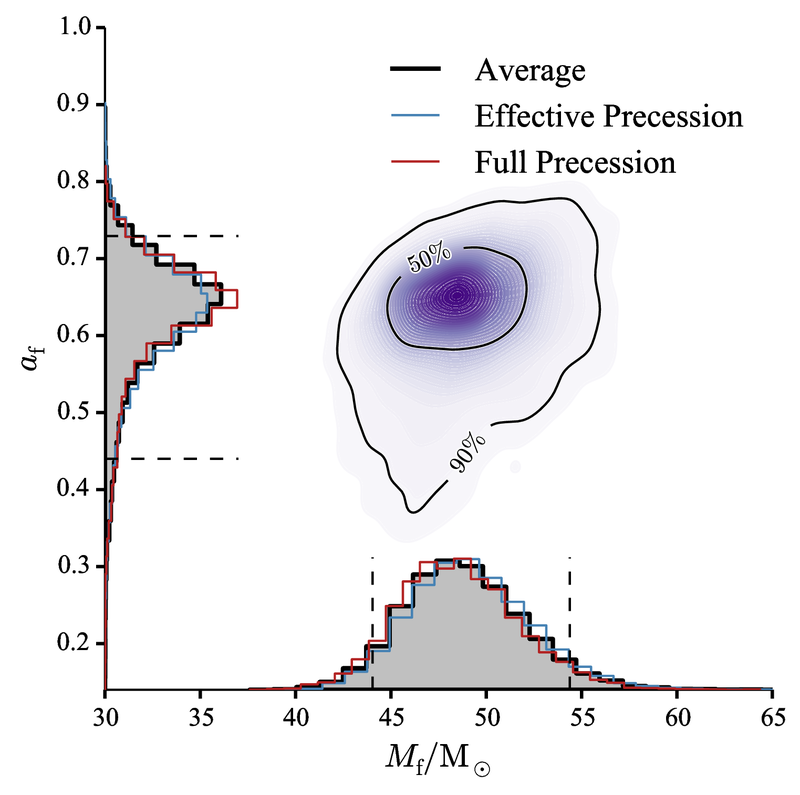 The one-dimensional plots at the top show the probability distributions for the total mass and chirp mass . 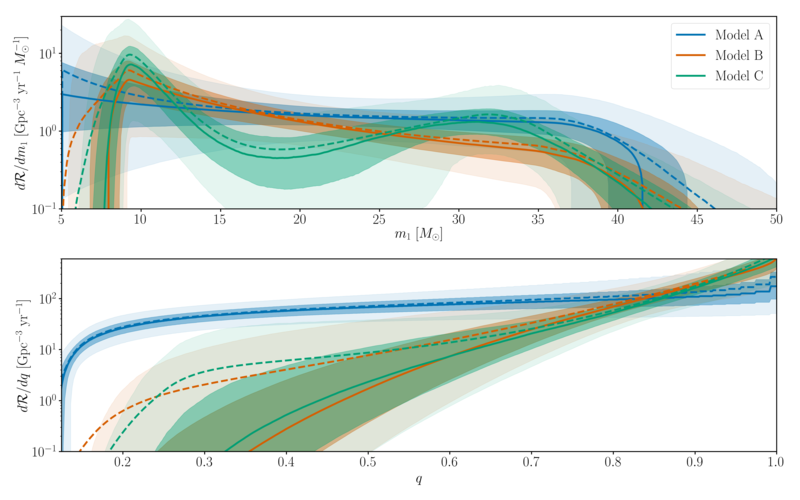 Figure 2 of the GW170608 Paper. I think this plot is neat. One caveat with regards to the masses is that the current results only consider spin magnitudes up to 0.89, as opposed to the usual 0.99. 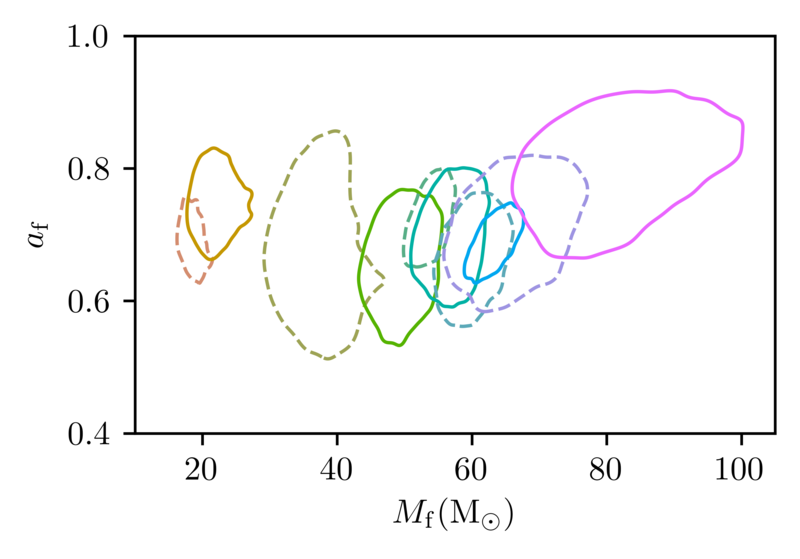 There is a correlation between the mass ratio and the spins: you can have a more unequal mass binary with larger spins. There’s not a lot of support for large spins, so it shouldn’t make too much difference. We use the full range in updated analysis in the O2 Catalogue Paper. 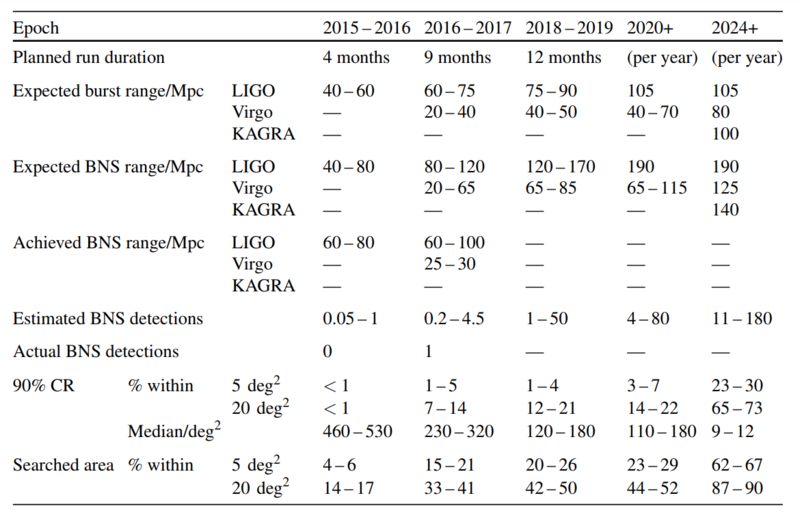 Speaking of spins, GW170608 seems to prefer small spins aligned with the angular momentum; spins are difficult to measure, so there’s a lot of uncertainty here. The best measured combination is the effective inspiral spin parameter . This is a combination of the spins aligned with the orbital angular momentum. For GW170608 it is , so consistent with zero and leaning towards being small and positive. For GW151226 it was , and we could exclude zero spin (at least one of the black holes must have some spin). The plot below shows the probability distribution for the two component spins (you can see the cut at a maximum magnitude of 0.89). 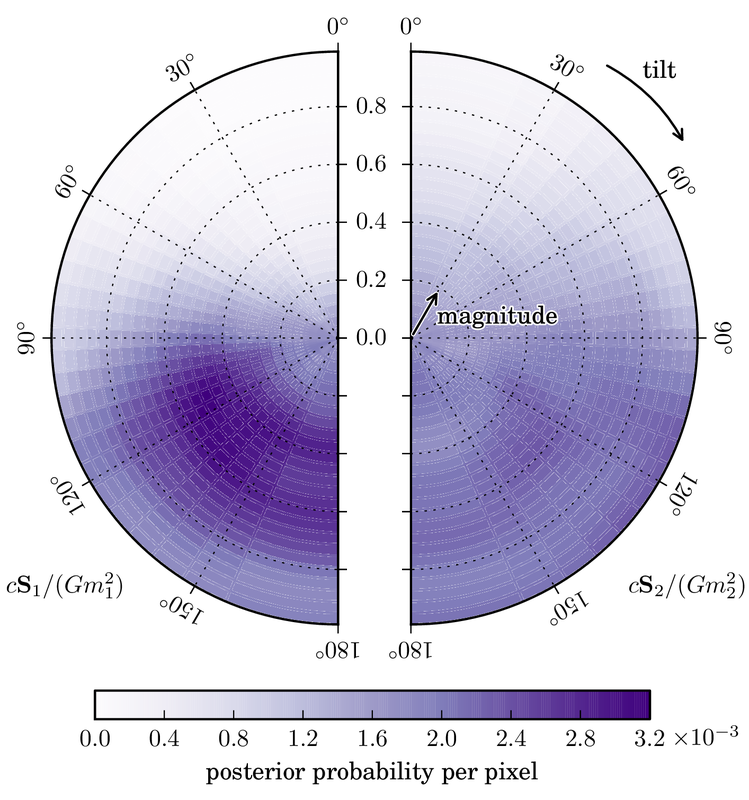 We prefer small spins, and generally prefer spins in the upper half of the plots, but we can’t make any definite statements other than both spins aren’t large and antialigned with the orbital angular momentum. 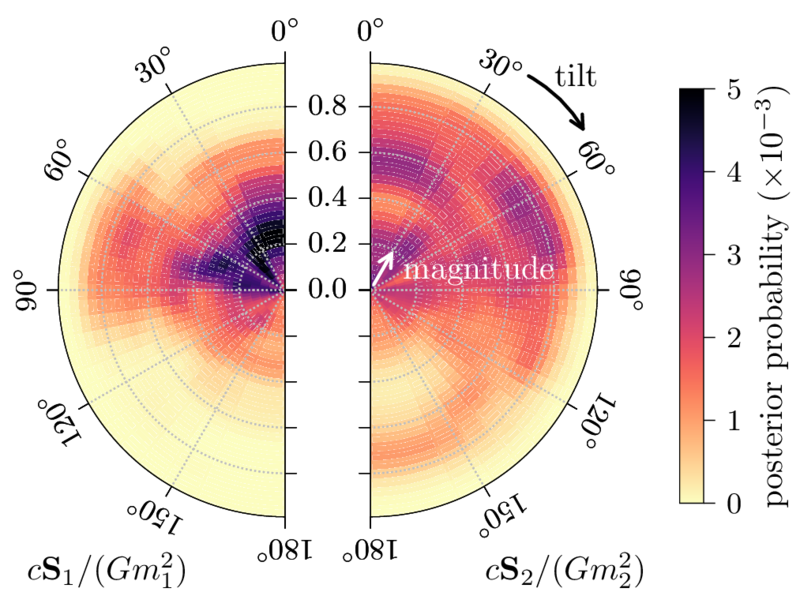 Estimated orientation and magnitude of the two component spins. The distribution for the more massive black hole is on the left, and for the smaller black hole on the right. The probability is binned into areas which have uniform prior probabilities, so if we had learnt nothing, the plot would be uniform. This analysis assumed spin magnitudes less than 0.89, which is why there is an apparent cut-off. 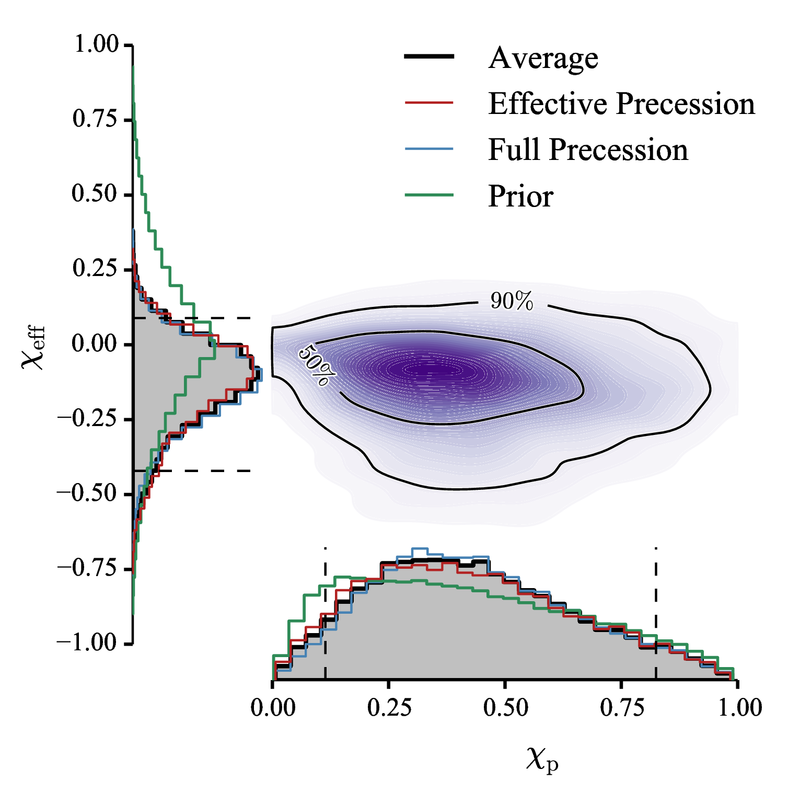 Part of Figure 3 of the GW170608 Paper. For the record, I voted against this colour scheme. 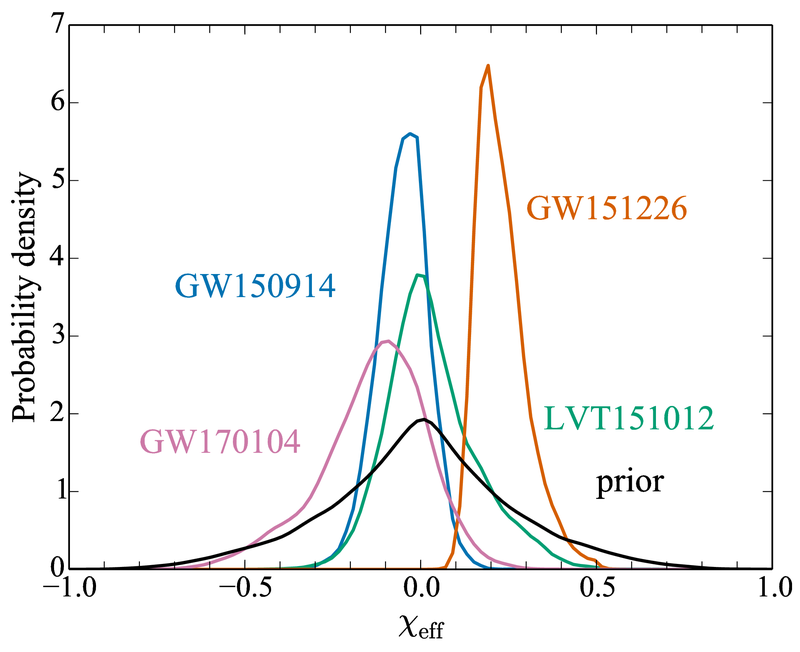 The properties of GW170608’s source are consistent with those inferred from observations of low-mass X-ray binaries (here the low-mass refers to the companion star, not the black hole). These are systems where mass overflows from a star onto a black hole, swirling around in an accretion disc before plunging in. We measure the X-rays emitted from the hot gas from the disc, and these measurements can be used to estimate the mass and spin of the black hole. The similarity suggests that all these black holes—observed with X-rays or with gravitational waves—may be part of the same family. 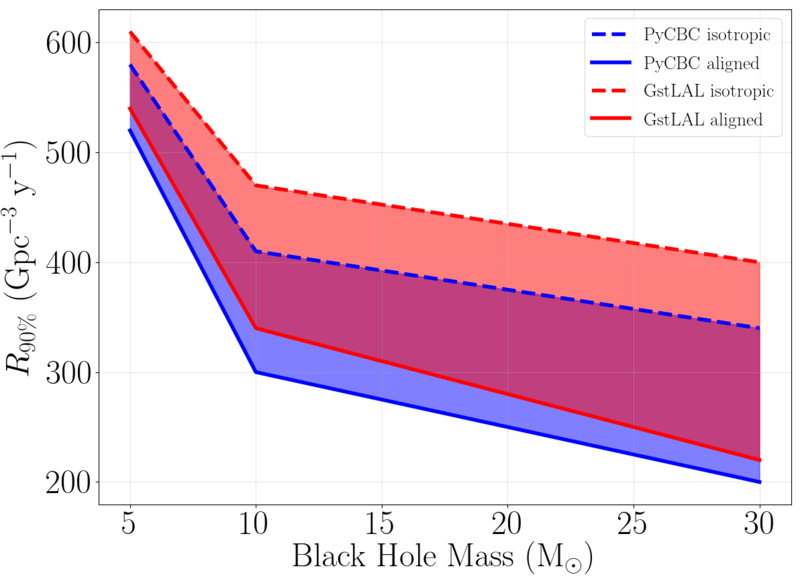 Estimated black hole masses inferred from low-mass X-ray binary observations. Figure 1 of Farr et al. (2011). 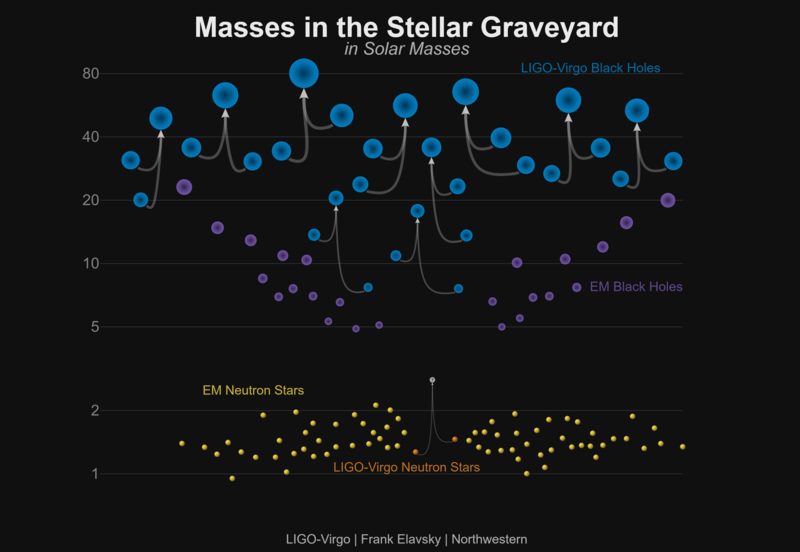 The masses overlap those of the lower mass binary black holes found by LIGO and Virgo. 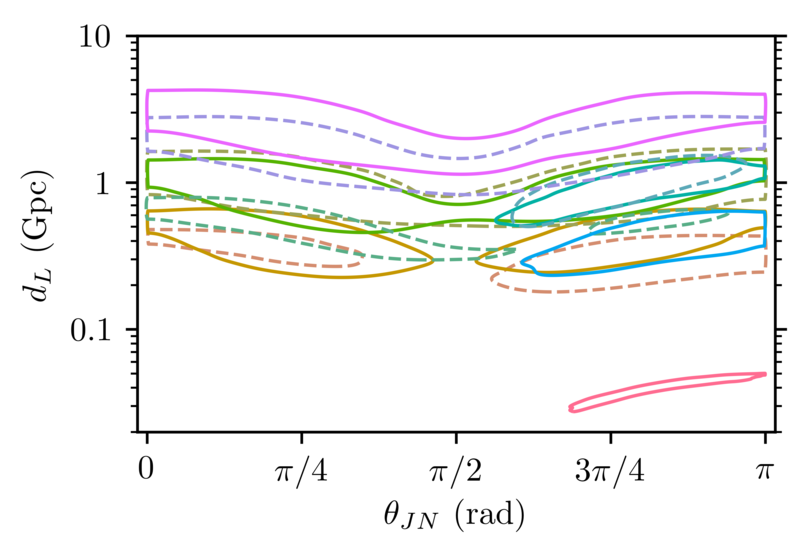 We’ll present update merger rates and results for testing general relativity in our end-of-O2 paper. The low mass of GW170608’s source will make it a useful addition to our catalogue here. Small doesn’t mean unimportant. 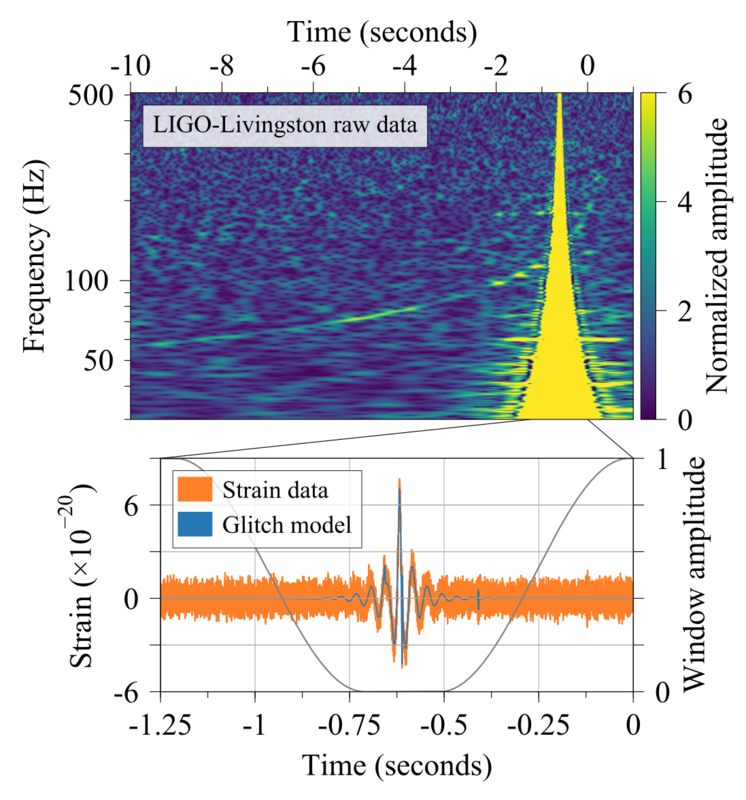 Science summary: GW170608: LIGO’s lightest black hole binary? If you’re looking for the most up-to-date results regarding GW170608, check out the O2 Catalogue Paper. A lot of time and effort goes into monitoring, maintaining and tweaking the detectors so that they achieve the best possible performance. The majority of work on the detectors happens during engineering breaks between observing runs, as we progress towards design sensitivity. However, some work is also needed during observing runs, to keep the detectors healthy. On 8 June, Hanford was undergoing angle-to-length (A2L) decoupling, a regular maintenance procedure which minimises the coupling between the angular position of the test-mass mirrors and the measurement of strain. Our gravitational-wave detectors carefully measure the time taken for laser light to bounce between the test-mass mirrors in their arms. If one of these mirrors gets slightly tilted, then the laser could bounce of part of the mirror which is slightly closer or further away than usual: we measure a change in travel time even though the length of the arm is the same. To avoid this, the detectors have control systems designed to minimise angular disturbances. Every so often, it is necessary to check that these are calibrated properly. To do this, the mirrors are given little pushes to rotate them in various directions, and we measure the output to see the impact. Examples of how angular fluctuations can couple to length measurements. Here are examples of how pitch rotations in the suspension level above the test mass (L3 is the test mass, L2 is the level above) can couple to length measurement . Yaw fluctuations (rotations about the vertical axis) can also have an impact. 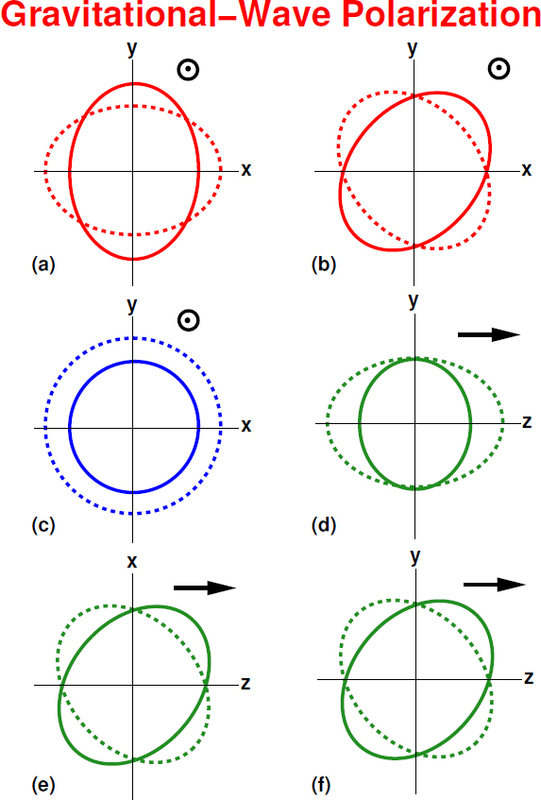 Figure 1 of Kasprzack & Yu (2016). The angular pushes are done at specific frequencies, so we we can tease apart the different effects of rotations in different directions. The frequencies are in the range 19–23 Hz. 30 Hz is a safe cut-off for effects of the procedure (we see no disturbances above this frequency). Imprint of angular coupling testing in Hanford. The left panel shows a spectrogram of strain data, you can clearly see the excitations between ~19 Hz and ~23 Hz. 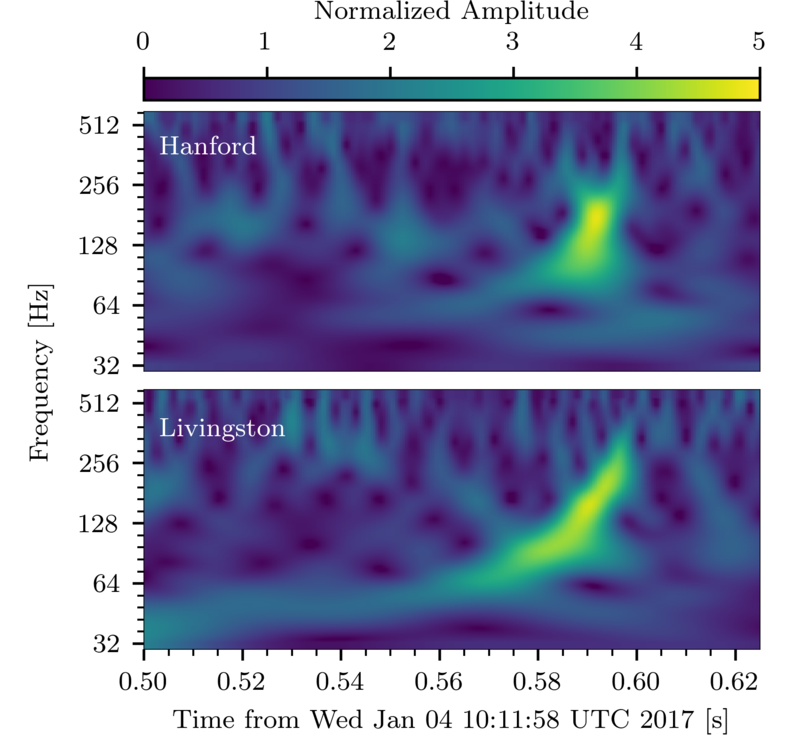 The right panel shows the amplitude spectral density for Hanford before and during the procedure, as well as for Livingston. The procedure adds extra noise in the broad peak about 20 Hz. There are no disturbances above ~30 Hz. 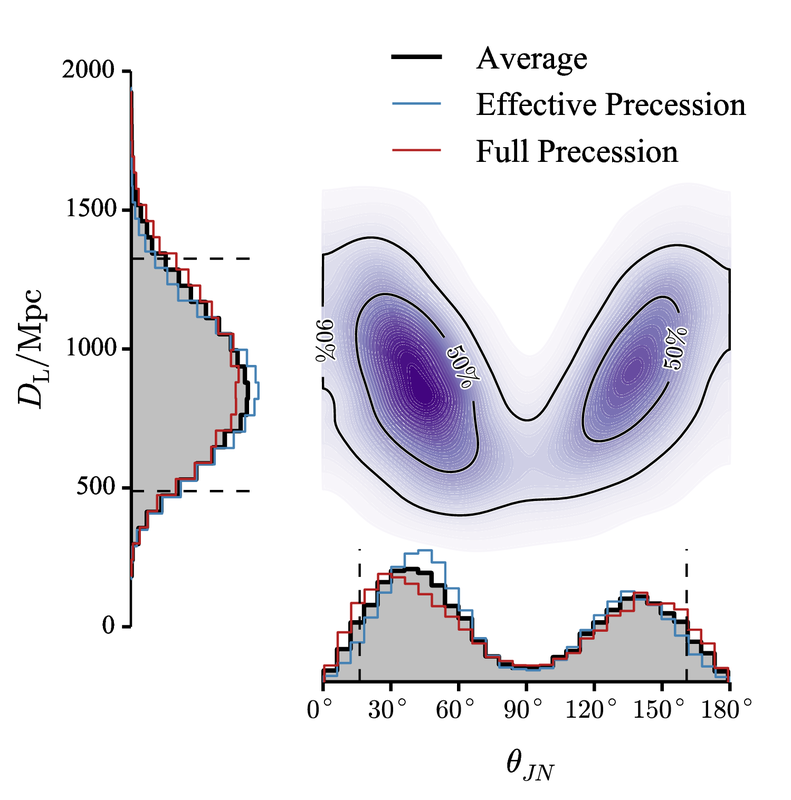 Figure 4 of GW170608 Paper. While we normally wouldn’t analyse data from during maintenance, we think it is safe to do so, after discarding the low-frequency data. If you are worried about the impact of including addition data in our rate estimates (there may be a bias only using time when you know there are signals), you can be reassured that it’s only a small percent of the total time, and so should introduce an error less significant than uncertainty from the calibration accuracy of the detectors. Unusually for an O2 event, Aaron Zimmerman was not on shift for the Parameter Estimation rota at the time of GW170608. Instead, it was Patricia Schmidt and Eve Chase who led this analysis. Due to the engineering work in Hanford, and the low mass of the system (which means a long inspiral signal), this was one of the trickiest signals to analyse: I’d say only GW170817 was more challenging (if you ignore all the extra work we did for GW150914 as it was the first time). 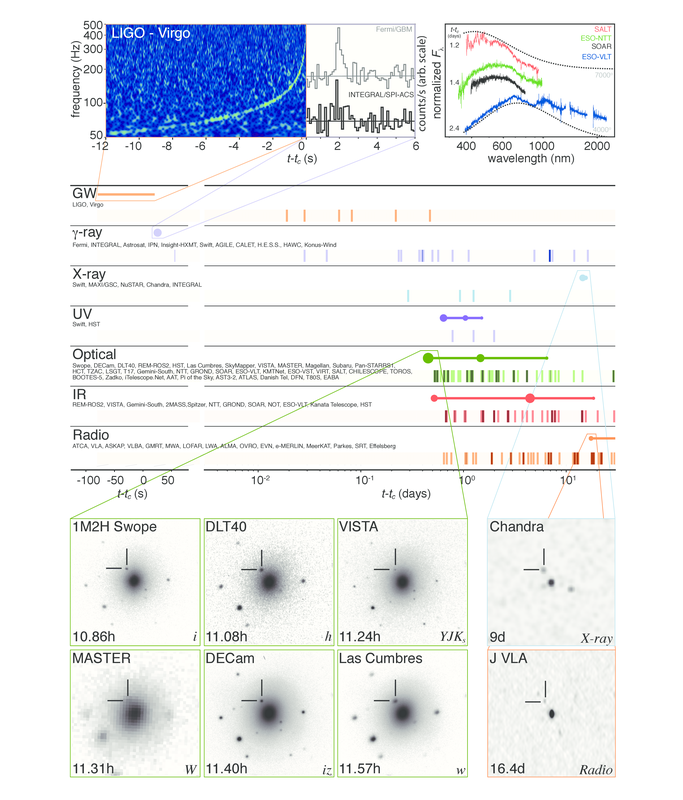 DLT40—an optical search designed for supernovae. 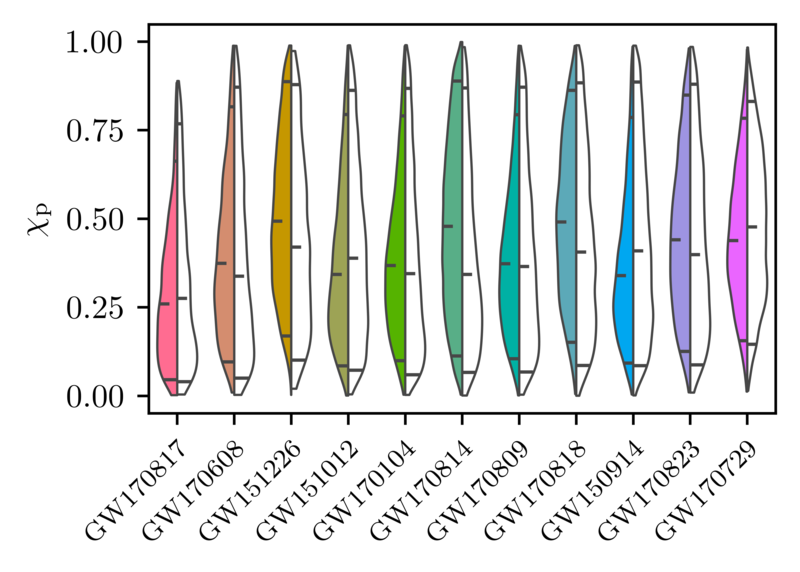 This paper covers the whole of O2 including GW170104, GW170814, GW170817 plus GW170809 and GW170823. Mini-GWAC—a optical survey (the precursor to GWAC). 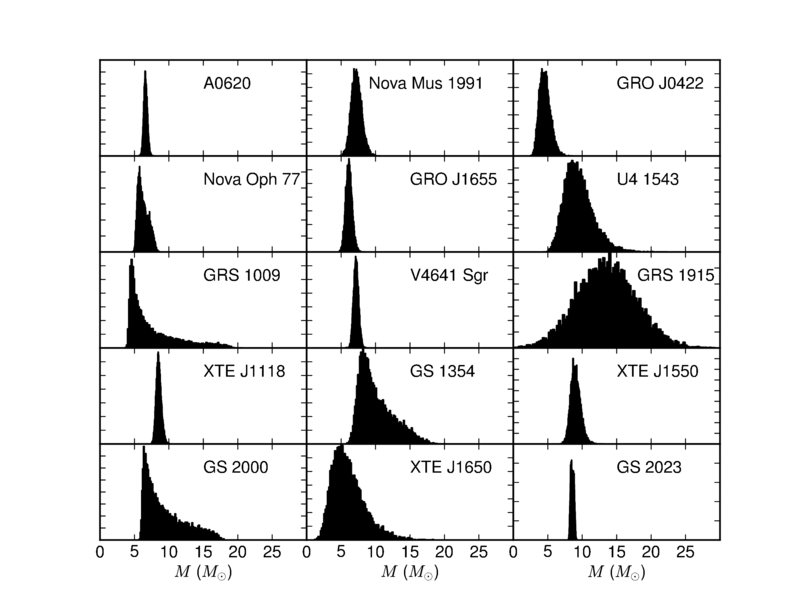 This paper covers the whole of their O2 follow-up (including GW170104). 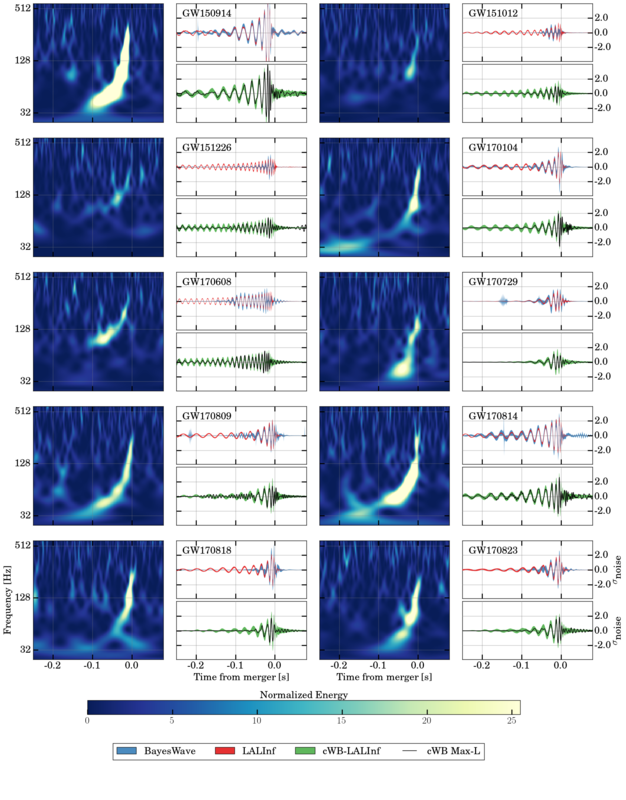 The VLA and VLITE—radio follow-up, particularly targeting a potentially interesting gamma-ray transient spotted by Fermi. If you are wondering about the status of Virgo: on June 8 it was still in commissioning ahead of officially joining the run on 1 August. We have data at the time of the event. The sensitivity is of the detector is not great. We often quantify detector sensitivity by quoting the binary neutron star range (the average distance a binary neutron star could be detected). Around the time of the event, this was something like 7–8 Mpc for Virgo. 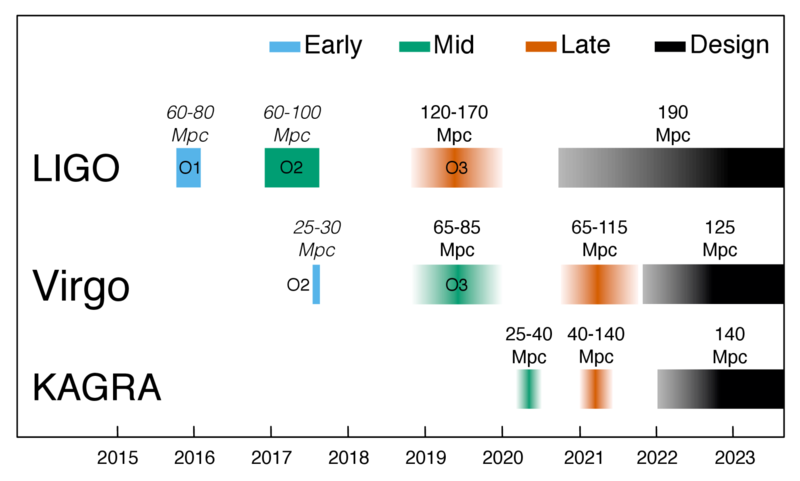 During O2, the LIGO detectors have been typically in the 60–100 Mpc region; when Virgo joined O2, it had a range of around 25–30 Mpc. 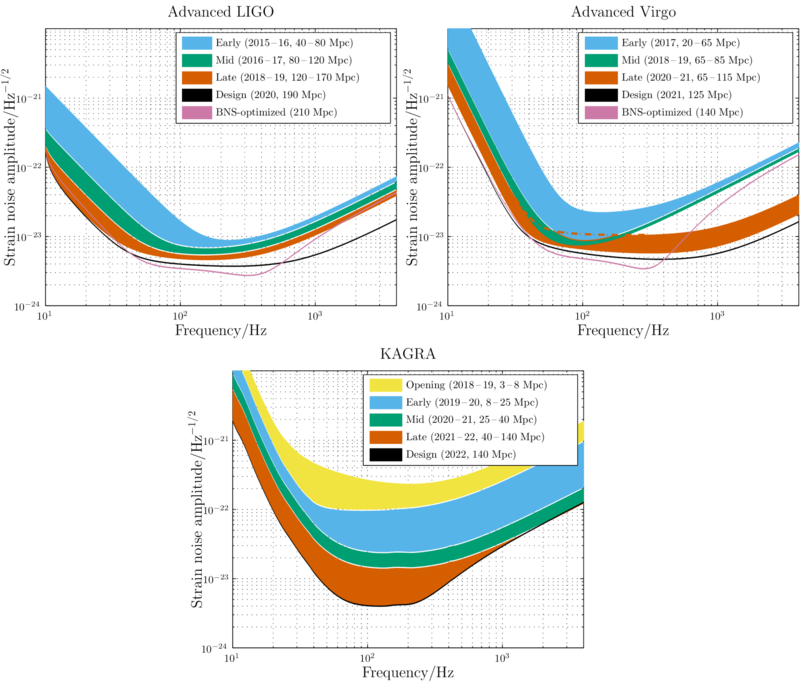 Unsurprisingly, Virgo didn’t detect the signal. 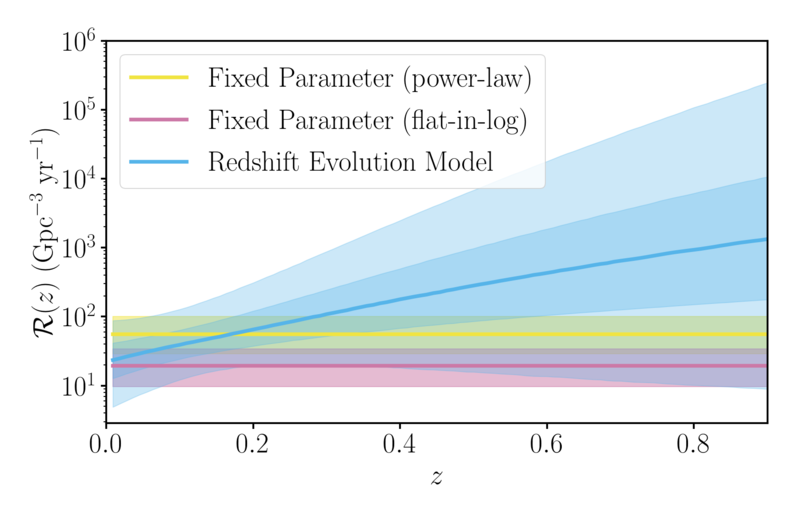 We could have folded the data in for parameter estimation, but it was decided that it was probably not well enough understood at the time to be worthwhile. 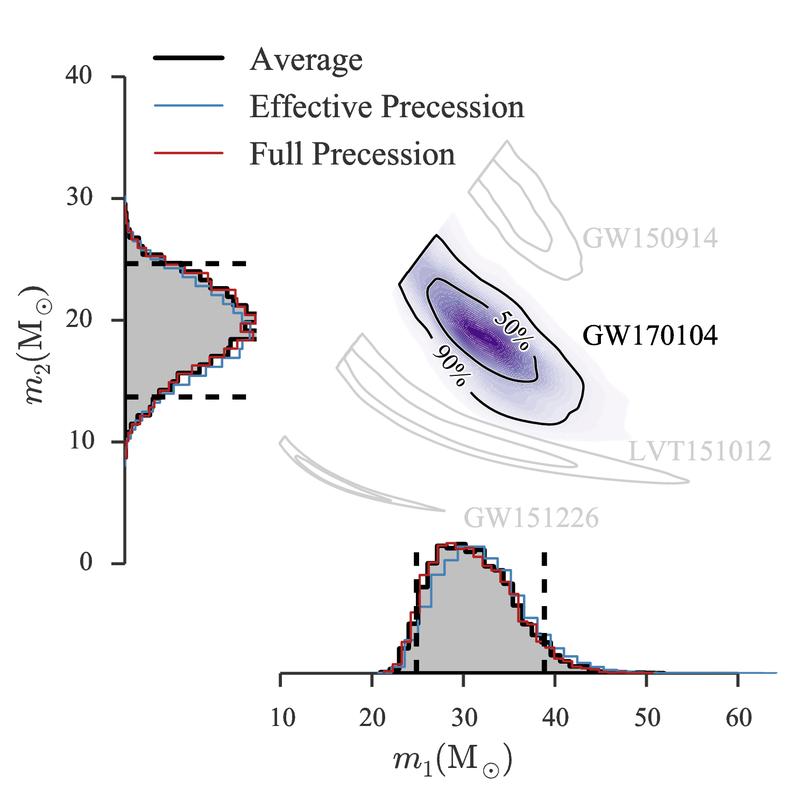 The GW170608 Paper is the first discovery paper to be made public before journal acceptance (although the GW170814 Paper was close, and we would have probably gone ahead with the announcement anyway). I have mixed feelings about this. On one hand, I like that the Collaboration is seen to take their detections seriously and follow the etiquette of peer review. On the other hand, I think it is good that we can get some feedback from the broader community on papers before they’re finalised. 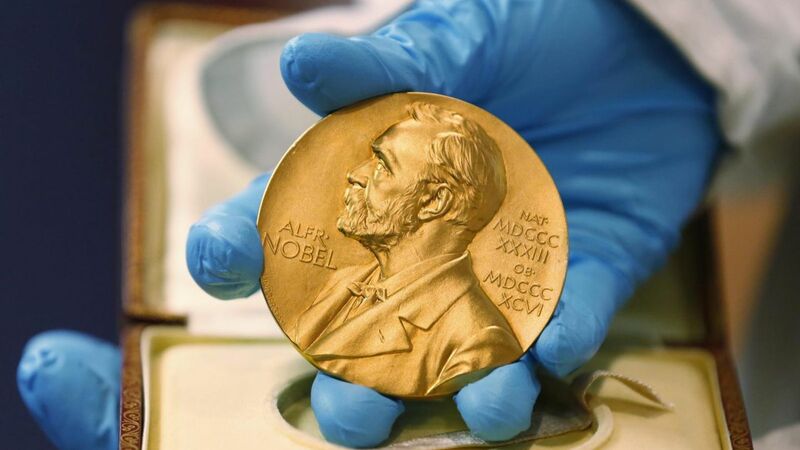 I think it is good that the first few were peer reviewed, it gives us credibility, and it’s OK to relax now. Binary black holes are becoming routine. This is also the first discovery paper not to go to Physical Review Letters. I don’t think there’s any deep meaning to this, the Collaboration just wanted some variety. Perhaps GW170817 sold everyone that we were astrophysicists now? Perhaps people thought that we’ve abused Physical Review Letters‘ page limits too many times, and we really do need that appendix. I was still in favour of Physical Review Letters for this paper, if they would have had us, but I approve of sharing the love. There’ll be plenty more events.